Recorded at Studio Litho and Red Room. Helms Alee’s sophomore album, Weatherhead, could turn any cultural critic into a historical revisionist. Let’s pull the buckshot back through the maw of a 20th century icon. Let’s reassemble the bloody mess and set a disenfranchised young man on a different trajec- tory, one devoid of celebrity and tragedy. Let’s re-envision the last twenty years. The other crucial variables can remain in place - hair metal still choked on its own excess, the beguiling mixed-gender vocal harmonies and alternating jangle and clang of The Pixies still seduced college radio, the antagonistic sludge of The Melvins continued to rumble across the globe, and the orchestrated discord of Sonic Youth still proved noise could hold artistic merit. But punk never broke, never became a cliche. Do you buy into Tolstoy’s belief that the individual is a mere pawn in history’s master plan? Would the lineage of rock music have found another reluctant voice of a generation? Much as Tolstoy suspected that a stillborn Napoleon would not have prevented another hegemonic ruler from sweeping across Europe, the tastes and tides of public demand would’ve most likely elevated another unglamorous tortured artist into the limelight. But it’s still tempting to think of a parallel universe where the idiosyncratic marriage of wounded pop music and wrathful dissonant rock never found a footing in the mainstream world. It’s a dream not born out of a disdain for the pairing of the opposing musical tactics of brawn and sophistication, but the disappointment that the balancing act is so commonly butchered by popular artists. These men, lacking vision, have turned it into a cheap formula. In the alternate reality, a band like Helms Alee reigns above all. Here, no one seeks to tame guitar squall to fit in a radio format or, inversely, needlessly dirty up a good hook to provide an air of authenticity. Here, Helms Alee’sbalance is the archetype - masterful and enthralling. Given the history of the last two decades and the deepening sense that melody and muscle compromise one another, Weatherhead becomes heroic. It’s not just gallant in intent, but in sound. Granted, heroism is subjective; listeners are bound to have their own preferred reverberations to conjure an inspired rallying cry. But Helms Alee’s gamut of timbres--from the most guttural blown-out roar to the most graceful lilting melody- -summon a sense of triumph, empowerment, and conquest. The relentless chugging fuzz and vocal harmonies of “Elbow Grease”, the concrete thrust of the central riff of “8/16”, the thunderstruck arpeggio of “Pretty As Pie”, the siren song of “Pig Pile”, the unbridled scuzz of “Ripper No Lube”, and the alternating agit-punk and anthemic approach of the title track all reinforces Helms Alee’s position as masters of diametrically opposed tactics. They are the true heroes and heroines of the loud-quiet-loud. Helms Alee’s sophomore album, Weatherhead, could turn any cultural critic into a historical revisionist. Let’s pull the buckshot back through the maw of a 20th century icon. Let’s reassemble the bloody mess and set a disenfranchised young man on a different trajectory, one devoid of celebrity and tragedy. Let’s re-envision the last twenty years. The other crucial variables can remain in place - hair metal still choked on its own excess, the beguiling mixed-gender vocal harmonies and alternating jangle and clang of The Pixies still seduced college radio, the antagonistic sludge of The Melvins continued to rumble across the globe, and the orchestrated discord of Sonic Youth still proved noise could hold artistic merit. But punk never broke, never became a cliche. Do you buy into Tolstoy’s belief that the individual is a mere pawn in history’s master plan? Would the lineage of rock music have found another reluctant voice of a generation? Much as Tolstoy suspected that a stillborn Napoleon would not have prevented another hegemonic ruler from sweeping across Europe, the tastes and tides of public demand would’ve most likely elevated another unglamorous tortured artist into the limelight. But it’s still tempting to think of a parallel universe where the idiosyncratic marriage of wounded pop music and wrathful dissonant rock never found a footing in the mainstream world. It’s a dream not born out of a disdain for the pairing of the opposing musical tactics of brawn and sophistication, but the disappointment that the balancing act is so commonly butchered by popular artists. These men, lacking vision, have turned it into a cheap formula. In the alternate reality, a band like Helms Alee reigns above all. Here, no one seeks to tame guitar squall to fit in a radio format or, inversely, needlessly dirty up a good hook to provide an air of authenticity. 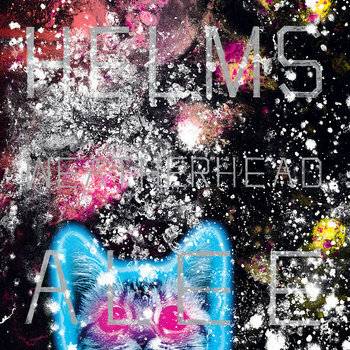 Here, Helms Alee’s balance is the archetype - masterful and enthralling. Weatherhead was recorded by Matt Bayles at Studio Litho and Red Room Studios in the Winter of 2010-2011. It’s set for release via Hydra Head Records on June 21st, 2011. Helms Alee are currently scheduled to hit the road with label mates Torche and Big Business in June 2011. Bear witnesses to the path that never saw fame and fortune taint the beguiling rumble and bow to the throne of Helms Alee.